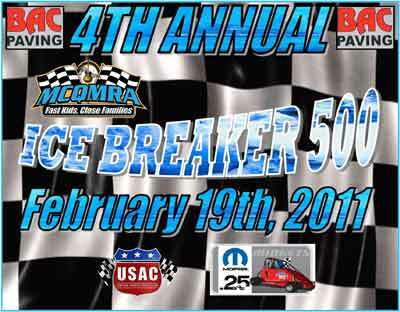 2011 "4th Annual ICE BREAKER 500"
*All competition will be held in accordance with the United States Auto Club's 2011 Official Competition Rules. *Open for USAC/QMA licensed members. *$35 registration per class for pre-registration applicants. $40 per class for non pre-registration participants. *Pre-registration guarantees you a minimum of a participation trophy. *Registration will not determine qualifying order. Pill draw to determine qualifying order.